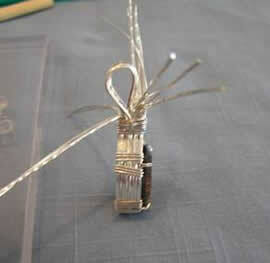 The bail wires (the wires the chain will go through) are from the 2 middle wires, one wire from each side. (I used 4 wires for this bail). Pull down and around the size dowel or pencil you choose. 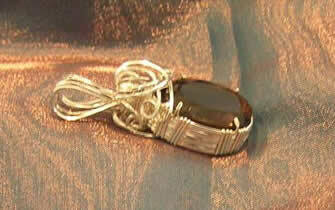 The bail size depends on what size the clasp you have on your chain. 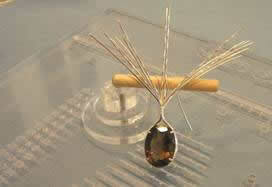 For this bail, I wrapped it with the ½ round wire, then cut the extra wire off. 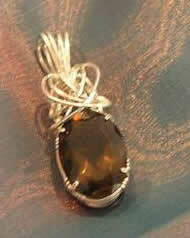 Make a V in the Bail to prevent the pendant from twirling around on you neck. 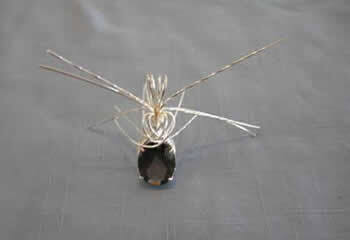 Now, start making pretty wire wrapping. I made heart shape wire with little loops at the end. To make the pretty work in front and back, hold the little loops with each of your hands and pull down, it will look like a heart. Be creative and make your own design. Make small loops on the 2 front wires. Do the same to the back 2 wires. Check for burrs and see if the oendant hangs correctly. Make adjustments as desired. Put a string through the bail and see if the tops of the bail are level.